Urban Horse promotes an Easyboot Glove Normal Fit Kit Hire Service - The Easyboot Fit Kit has been designed to help you find the correct size glove or glue on for your horses hooves. The easyboot glove is a revolutionary lightweight and simple hoof boot from Easycare. The price charged is a DEPOSIT ONLY for 3 X BOOT SHELLS. You will be refunded £35 (the price charged £45 less £10 admin fee). As most horses are within 1 or 2 sizes to keep down the return postage costs for the fit kit hoof boot hire service instead of sending out all 13 x different gloves sizes available for the UK we will send out 3 x as per your chosen sizes required! Your measurments will determine which size fit kit you need. For example, if your horse’s hoof measurements call for a size 1.5, order a 1.5, 2 and size 1 Glove shell. Keep in mind that most horses require larger boots on the front feet. You may need to order two EasyCare Glove Fit Kits be it NORMAL or WIDE Gloves. One to accommodate front feet and one to accommodate the rear feet. When the boots are returned within 14 days of receipt (clean and dry with no items missing, dirty or broken). You will be refunded £35 (the price charged £45 less £10 admin fee). Please note an additional £5 will be deducted for every late week thereafter. Please note you will be responsible for returning them to us at your cost, and we are not able to refund you until the kit is received by us so we do recommend a recorded method of postage. Easycare fit kits that are returned to us with parts missing, broken or dirty will be refunded less the cost to put them right again. Postage to send the Glove Hoof Boot shells is non refundable. As the glove and glue-on easyboots do not need any hardware or fastening systems, achieving a good fit is more important than ever. As proper fit is so vital, Easycare decided it would be best to offer these boots in half sizes to ensure a perfect fit for each individual hoof. Each shell has only four millimeters of width difference between the next shell size up or down. This tight gap between sizes helps ensure a snug fit, but it also means that there is little room for error in measuring and determining the proper size of boot. 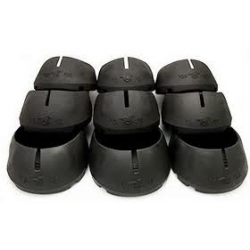 The Easycare Fit Kit allows consumers to fit their horse's feet in the Glue-On and/or Glove shell before ordering, to ensure the best fit possible without the hassle and wasted time of buying and returning multiple boots. Pre-fitting in the shell will ensure a perfect fit in both the Easyboot Glove or Easyboot Glue-On hoof boot lines and is especially helpful if your horse is between sizes or has one foot a slightly different size to the other. The shell used in both the Easyboot Glove and Easyboot Glue-On products is flexible and has a great deal of stretch. Although taking hoof measurements is a great starting point for fitting any hoof boot, the Fit Kit will allow you to see for certain if a the easyboot glove or glue-on will fit your horse's feet well, and exactly which size fits best. Easyboot Glove and Glue-On available in the following sizes - Please See Size Chart Below! The EasyCare Fit Kit is for the Easyboot Glove and Easyboot Glue-On only. Sizing on both of these boots is different than other boots in the EasyCare line. The important point to remember is that the Glove and Glue-On have totally different sizing from any of our other boots. Compare your measurement with the Easyboot Glove/Easyboot Glue-On size chart above. Please note all Easyboot Glove and Easyboot Glue-On size charts are in millimeters only. Your measurments will determine which size fit kit you need. For example, if your horse’s hoof measurements call for a size 1.5, order a 1.5, 2 and size 1 Glove shell. Keep in mind that most horses require larger boots on the front feet. You may need to order two EasyCare Glove Fit Kits be it WIDE or NORMAL Gloves. One to accommodate front feet and one to accommodate the rear feet. When the boots arrive, try them on the horse’s feet to determine the perfect boot size. The perfect boot size can be pushed on the hoof. The boot will be snug around the hoof wall and no gaps will appear. All portions of the shell will be below the hairline. The boot should fit snug and will be difficult to pull off even without glue. Record the proper boot size. If none of the boots in the Fit Kit fit the feet well, the Easyboot Glove and Easyboot Glue-On boots may not be right for your horse. There is a Glove WIDE fit kit available too. Please see Easyboot Glove WIDE fit kit horse service under the related products on this webpage above. The perfect boot size can be pushed on the hoof, but It should take a bit of effort. You should feel the shell flex as it goes over the hoof. The boot will be snug around the hoof wall and no gaps will appear. All portions of the shell will be below the hairline. The V at the front of the shell should expand like the shell in the photo. It should be very difficult to fit a hoof pick between the shell and the hoof. The boot should fit snug and will be difficult to pull off the hoof. A good fit will give you the impression that the shell will stay on the foot without glue or without a gaiter. It should fit like a “Glove”. Gaps (small or large) can be seen between the upper boot portion and the hoof. The V in the front of the shell does not expand. Viewing the photo below the V on the left boot has failed to expand (poor fit). The V on the right has expanded and is a good fit. A long heel (a heel that measures more than 1/2 an inch above the shell at the rear hairline). A horse with long heels may have success with the Easyboot Glue-On shell but will not have success with the Easyboot Glove. Have your horse trimmed by a farrier or hoof care professional. Make sure they are conscious about barefoot trimming methods, toe length and heel length. Chances are good that after trimming you will have success with the Fit Kit. For any assistance with choosing the right type and size of Easycare Hoof Boot please do not hesitate to email us on sales@urbanhorse.com or call us on 01434 422700 - We are here to help you find the right boot for your horse / pony!